In Germany, UFOP reports that the Food and Agriculture Organization of the United Nations price indices for vegetable oils and cereals have recently trended in opposite directions. 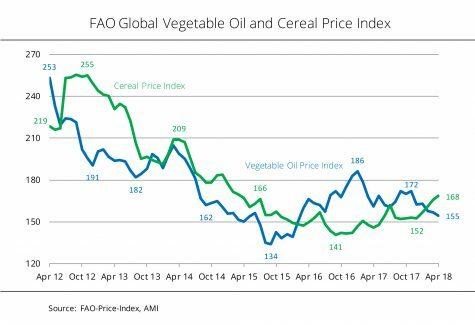 Whereas vegetable oils have been under considerable downward pressure, cereal prices have increased since the beginning of the year. Asking prices for vegetable oils decreased considerably over the first four months of 2018. After rising to the third highest level in 16 months in November 2017, the FAO vegetable oil price index, which illustrates the changes in international prices of the ten most important vegetable oils in world trade, has came down by 10 per cent, hitting its lowest level in more than two years. Weaker asking prices for palm and soybean oil weighed especially heavily on the index, Agrarmarkt Informations-Gesellschaft (AMI) reported. Significant growth in output at oil palm plantations combined with falling international demand put downward pressure on palm oil. Prices for soybean oil were pulled down by a surplus on the global market where soybean meal production yields more soybean oil than is currently used. By contrast, the FAO cereal price index has increased more than 10 per cent since the beginning of the year, following many years of weakness. This was mainly due to firm wheat prices, which rose sharply due to unfavourable growing conditions in the US. Asking prices for maize also firmed, driven by concerns over drought-related losses in Argentina and recently also Brazil.